HELP US NOMINATE DESERVING SMALL BUSINESSES! This annual awards program presented by The Partnership of the Chamber of Commerce Association of Alabama and the Business Council of Alabama recognizes the very best in Alabama small business. The 2018 Alabama Small Business of the Year finalists will be selected from nominations made by local Alabama chambers of commerce. 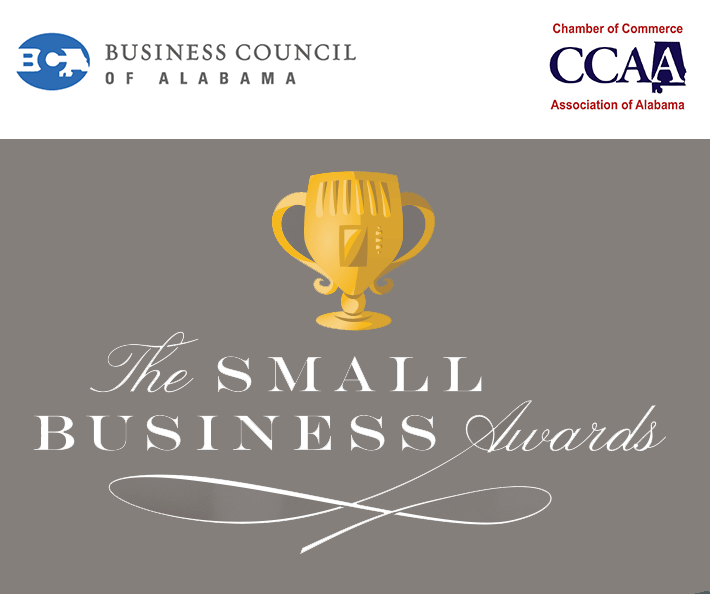 Alabama chambers of commerce will have opportunity to nominate one member small business for each award category. Awards will be presented in four categories: emerging (in business fewer than five years), Small Business of the Year (1-10 employees), Small Business of the Year (11-50 employees), and Small Business of the Year (51-100 employees). The nominees will be judged in four categories: community involvement, chamber participation, business success, and overall deservedness, and the winners will be announced at the CCAA/BCA Annual Meeting on December 7, 2018 at the Harbert Center in Birmingham. In addition, one overall Small Business of the Year will be chosen from all entries to participate in the U.S. Chamber of Commerce’s Dream Big Small Business of the Year Award. Businesses eligible for nomination should be members of the Alexander City Chamber of Commerce. For a complete list of eligible businesses, click here. Thank you for nominating a deserving local business for the Small Business Awards!